Crochet five of our most adorable amigurumi patterns for someone you love. From unicorns to sea creatures, these sweet and innovative patterns will charm you and yours. What’s cute, cuddly, crocheted, and sure to make you smile? Amigurumi! Amigurumi patterns have captivated crocheters for years now, and the designs have only become more inventive and adorable. Amigurumi can take the form of animate or inanimate objects, but whether you crochet a forest animal, a fanciful creature, or a rainbow in the sky, each one will delight the person who receives it—or crochets it! These crocheted companions are immensely huggable. But they also bring joy simply sitting on a shelf, a desk, or a dresser, ready to lift your spirits at a glance. We love amigurumi patterns at I Like Crochet, but even more, we love sharing them with you. That’s why we’ve gathered a collection of our favorites, starting with the whimsical Confetti the Unicorn. Confetti is a peaceful friend who will prance right into your heart. This magical amigurumi unicorn enchants with its pure white body and flowing rainbow mane and tail. 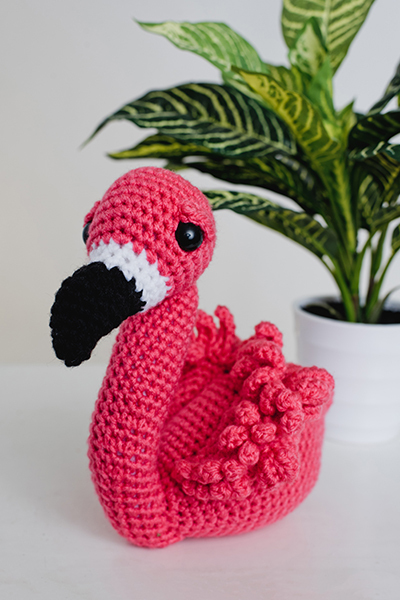 Not only will you enjoy making this pattern, you’ll learn some surprise shaping techniques to expand your crochet amigurumi skills. And here’s a bit of magic—the pattern is worked continuously in the round, the unicorn’s horn twisting naturally as you crochet! You work this easy pattern with a large hook for the legs, body, and head. Stuff and sew the unicorn together and then add the rainbow fringe to the mane and tail—and don’t forget the hooves. Stitch on the eyes, and Confetti the Unicorn is ready to romp. Confetti stands approximately 8½” high and will perch on a desk, bed, or shelf as a decoration or while waiting for playtime. 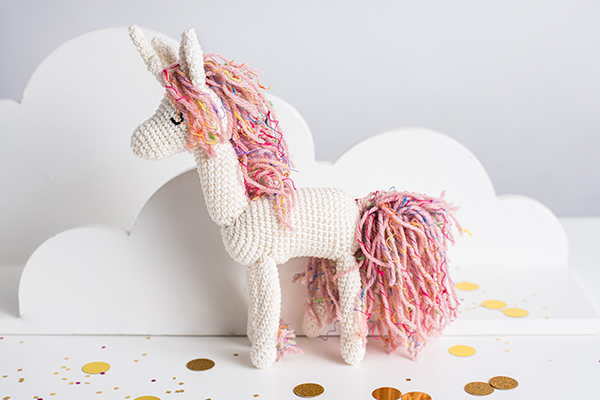 You can create your own amigurumi unicorn in any color yarn you fancy. In fact, why not crochet a whole herd of them—couldn’t everyone use more whimsy and magic in their life? To that end, we have many more adorable amigurumi patterns you can add to your collection, and we can’t wait to tell you about them. We’ve got crochet amigurumi patterns to delight everyone! What’s a unicorn without a rainbow? The two just go together, and so you’ll want to crochet the amigumuri Rainbow Pillow next. 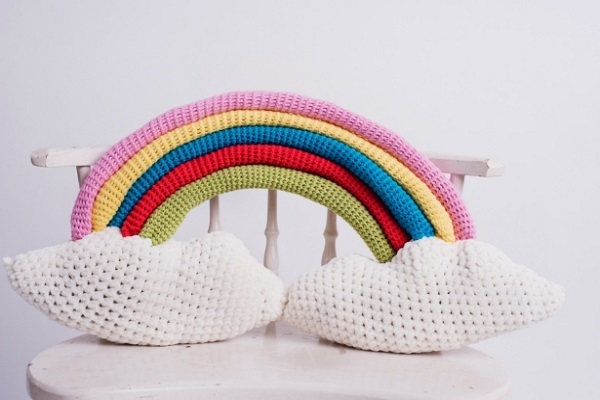 This quick and easy pattern, worked with bulky yarn, takes shape by crocheting the clouds first, then the rainbow bands. Feel free to mix up the colors to make your rainbow unique. And here’s a trick to shaping the bands: Take some foil, roll it up, and cut it the same length of each color. Lightly pad the outline of the foil and stop up everything with adhesive tape. Then insert the foil inside each color of the rainbow. Now, your pillow is perfectly arched and ready to brighten even the dreariest day. Everyone wants a friend like Ember the Fox. With such a sweet face, huggable body, and big, bushy tail, how could you resist? 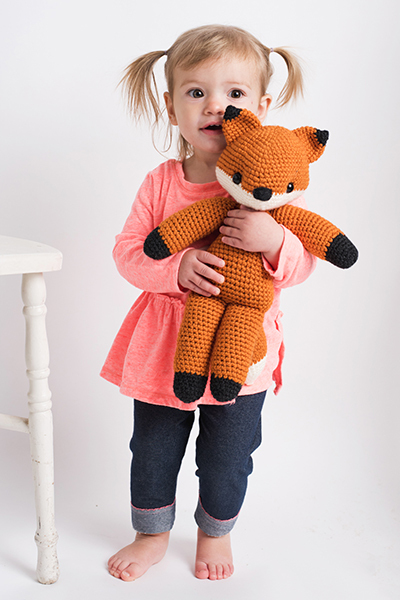 Ember is a classic amigurumi toy that little ones, especially, love. Just be sure to stitch on the eyes and nose, or use safety eyes. Each part of the little fox’s body is worked in the round in the classic crochet amigurumi style, and then the pieces are sewn together. Ember makes a wonderful baby shower or birthday gift. But if you want to keep this cute critter for yourself, we understand completely! There’s an amigumuri pattern for every skill level and a project for every interest! Cozy Bubbles the Octopus will wrap you up in hugs! 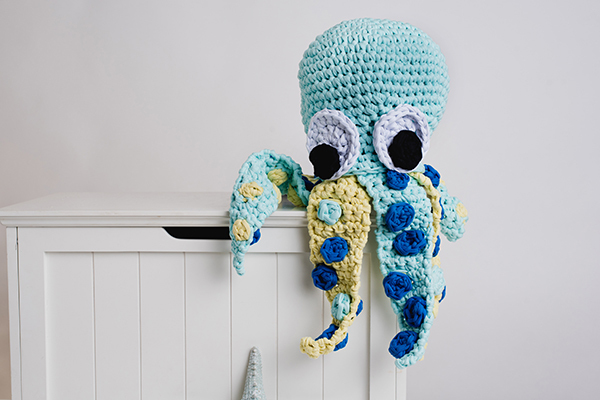 At 13.75” (35 cm) x 27.5” (70 cm), this sea creature is a friendly giant whose chunky yarn makes for a cozy and durable companion. Bubbles’ bobbles are essentially made by working five double crochets into the same stitch. Despite its size, this octopus amigumuri is easy and quick to make. The head starts with a magic ring and follows with a series of increases and decreases. Crochet the eyes, belly, tentacles, and bobbles, and your seaworthy friend will ready for your arms. You can’t feel blue when Ingo the Flamingo is by your side! This sweet bird with curly pink feathers will brighten anyone’s day—and makes a wonderful addition to a nursery. Everyone will ooh and ahh when Ingo appears at a baby shower or as a gift for a friend. Who can resist those soulful eyes or comical beak? At 8” x 8”, Ingo is the perfect size for small hands to hold or to take watchful perch on a shelf. Worked in rounds, you make each body part separately and whip stitch them together. Fluff those wing feathers, and enjoy your new pink companion. These five adorable amigumuri patterns guarantee you’ll always be able to make a friend. With a rainbow of yarns and our step-by-step instructions, we know you’ll have fun making each design and sharing the joy of amigurumi with everyone you know.